Here's something to help get motivated: National Walk to Work Day is this Friday October 1 - click on the link to find out more and get some tips on how to walk to work if you think you live too far away. There's also the Women's and Girls' Jogalong this Sunday (being the first Sunday of the month) at beautiful Weston Park in Yarralumla - 8.45am for aerobics warm up then staggered starts from 9am (3km walkers start first). I missed last month but hope to make it there this time! 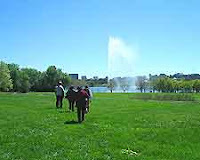 Floriade is also a wonderful event to spend a lot of time walking enjoying Canberra spring time. It's on until Sunday October 10.